It could not have been a more perfect night for Luke Bryan to take the stage at Target Field in Minneapolis, MN for his What Makes You Country XL Stadium Sized Tour. K102 and BUZ’N had numerous pre-parties around the stadium which were giving people a chance to win meet and greets, seat upgrades and to start the fun early. The stage needed to be warmed up before Luke Bryan could shake it with us. DJ Rock was spinning hits before the concert and in between acts which kept the party going all night long. DJ Rock even played a “walk-up song” for each of the acts before coming on. For example, ‘Jukebox Hero’ for Jon Pardi, ‘Better Now’ by Post Malone for Sam Hunt and ‘Let Me Clear My Throat’ for Luke Bryan. Country newcomer, mullet rocking, Morgan Wallen, took to the stage and captured the crowd with his songs, ‘Up Down’ and ‘The Way I Talk.’ Although he first made his music debut on The Voice in 2014, his songwriting and poise for performance have helped him find success so quickly. We guarantee there were more Morgan Wallen fans leaving the stadium then there were coming into the night. Up next was Pardi time with the handsome cowboy, Jon Pardi. He took to the stage playing along on his guitar to his top hits from his California Sunrise album, which included: ‘Heartache on the Dance Floor,’ ‘Head Over Boots,’ ‘Dirt on my Boots,’ and ‘She Ain’t In It.’ Pardi’s sound is true to country music as he strives to keep it traditional. Sam Hunt shared with the crowd how he started out playing with his college roommates and living on nothing but gas station pizza until one song changed everything. Sam Hunt co-wrote Billy Currington’s ‘We Are Tonight’ which allowed him to continue writing and making music. To hear him perform the song that really got him going toward success was surreal. Sam Hunt also gave credit to the roots of Nashville that continually inspires him and his music. He played a few of his favorite songs that you hear in Nashville which included ‘Where the Green Grass Grows’ by Tim McGraw for example. He ended his time on stage with ‘Body Like a Back Road’ which was a perfect way to leave the crowd ready for Luke Bryan. 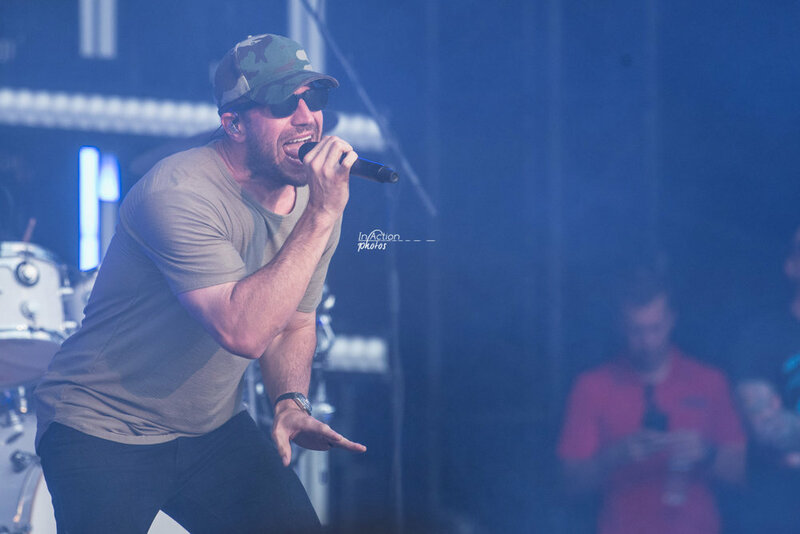 Sam Hunt’s talent of being able to switch back and forth between talking and singing is a unique spin on music. His upbeat songs are easy to sing along to and get stuck in your head on repeat. It's possible that a good portion of the crowd came to see Sam Hunt and he did not disappoint. Luke Bryan started the night with a bang which included numerous rounds of fireworks from behind him as he came out singing ‘Country Girl (Shake it For Me).’ He was setting the tone right away that tonight was going to be a good night. He sang so many of his top hits that the list goes on and the songs ranged from all of his albums. ‘Most People are Good,’ Light It Up,’ and ‘What Makes You Country’ represented his newest album, What Makes You Country. Others included: ‘I Don’t Want This Night to End,’ ‘Someone Else Calling You Baby,’ ‘Drunk On You,’ ‘Crash My Party,’ ‘Drink a Beer,’ ‘Strip It Down’ and the list goes on and on. His crowd interaction was awesome as he brought Minnesota into a lot of his songs and told stories/interacted with the crowd quite often. He sang ‘Huntin’ Fishin’ and Lovin’ Everday’ after telling us he spent the day fishing on the St. Croix River. He brought a fan to the stage and shared a beer during ‘All My Friends Say.’ Luke Bryan even made a comment on how he would try not to be Blake Shelton and fall on stage, despite still celebrating his birthday from Tuesday. The night brought two special milestones for the crowd in Minneapolis. This show at Target Field officially gave Luke Bryan the privilege of being the first artist to headline all three stadiums in Minneapolis. He joked on stage how he will be retiring now that he has accomplished this feat. Also, the Minneapolis crowd were the first people to see the new music video for ‘Sunrise, Sunburn, Sunset’ as it played on the big screens and all stadium TVs at sunset and about 10 minutes before Luke Bryan took to the stage. Upon following ‘Rain is a Good Thing,’ Luke exited the stage and the screams and cheers filled the stadium. The crowd knew there was more to come as no one moved from their sets. After a little wait, Luke Bryan came back on stage reppin’ a Minnesota Twins shirt. He gave us an ending that left us wanting more with his performances of ‘Move’ and ‘That’s My Kinda Night.’ The show started with a boom and ended the same way as fireworks lit up the Minneapolis skyline. Luke Bryan absolutely knows how to put on a show from start to finish. The crowd was all in the entire time. That was definitely our kinda night and we can’t wait until he comes back to Minneapolis in the future!